The latest experimental signing to Ninja, Daedelus was plucked from the same fruitful LA music stable responsible for Ammoncontact, Prefuse 73 and Madlib. Too awkward to be termed hiphop and with greater warmth that your standard electronic composition, his emotionally charged melodies drift weightlessly over an esoteric collection of beats - all programmed in dreamtime. More a Keats than a Dilla, Daedelus approaches his art in the vein of a romantic poet. "Everything should be overwrought and melodramatic," he asserts. "The romantic era in music is a great example of people doing that. I don't understand why producers today aren't more engaged in making emotional statements. It's so easy and immediate." This fascination also extends into his live shows, where Daedelus has been known to dress in full Edwardian attire. "It's just something me and my girl like to do," he shrugs. Born Alfred Weisberg - Roberts, Daedelus stole his stage name from the James Joyce novel The Portrait Of An Artist As A Young Man. Although born and bred in Santa Monica, he prefers to trace his roots back to Wales. "It's quite ridiculous," he laughs, "but I was obsessed with the place from a very young age. When I was 13, I begged my parents to go there and it kind of cemented it for me." Growing up, Daedelus played bass clarinet in various "awkward and less awkward" situations, and was even a part of marching band. A passion for early rave records and private radio stations sparked an interest in hiphop and the art of MCing. "It was so crazy and wonderful," he recalls. "To have someone rambling over the track and seemingly getting the way of the music was totally foreign to me." His first foray into the music scene came with a release on obscure label Thalo." It was all based around this answering machine message of this woman who was quite crazy and ranting. I was trying to be respectful for her sanity, but at the same time I wanted to showcase her strange world." It was the full length Invention of Plug Research, a confusing mix of '60s, '70s and '20s found sounds, that had people like Madlib taking notice. The Quiet Party and Madlib followed, and subsequently collaborations with Prefuse 73. His current release, Exquisite Corpse, takes its name from a 19th Century surrealist game, where players would write a phrase on a piece of paper, conceal it and pass it onto the next player. Adapting the concept into a musical format, Daedelus approached a dreamlist of collaborators including Mike Ladd, Prefuse 73 and Laura Darling. "No one ever got to hear each other's tracks and the album became a misfit." One of the biggest surprises in the studio came from the inimitable MF DOOM. 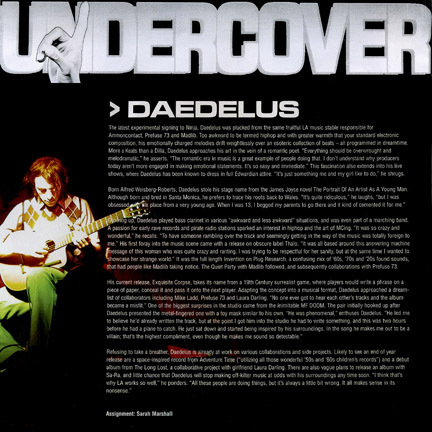 The pair initially hooked up after Daedelus presented the metal-fingered one with a toy mask similar to his own. "He was phenomenal," enthuses Daedelus. "He led me to believe he'd already written the track, but at the point I got him into the studio he had to write something, and this was two hours before he had a place to catch. He just sat down and started being inspired by his surroundings. In the song he makes me out to be a villain; that's the highest compliment, even though he makes me sound so detestable." Refusing to take a breather, Daedelus is already at work on various collaborations and side projects. Likely to see an end of year release are a space-inspired record from Adventure Time ("utilizing all those wonderful '50s and '60s children's records") and a debut album from The Long Lost, a collaborative project with Girlfriend Laura Darling. There are also vague plans to release an album with Sa-Ra, and the little chance that Daedelus will stop making off-kilter music at odds with his surroundings any time soon. "I think that's why LA works so well," he ponders. "All these people are doing things, but it's always a little bit wrong. It makes sense in its nonsense."